Today I have the pleasure to welcome an amazingly talented paper crafter to our blog as Guest Designer. 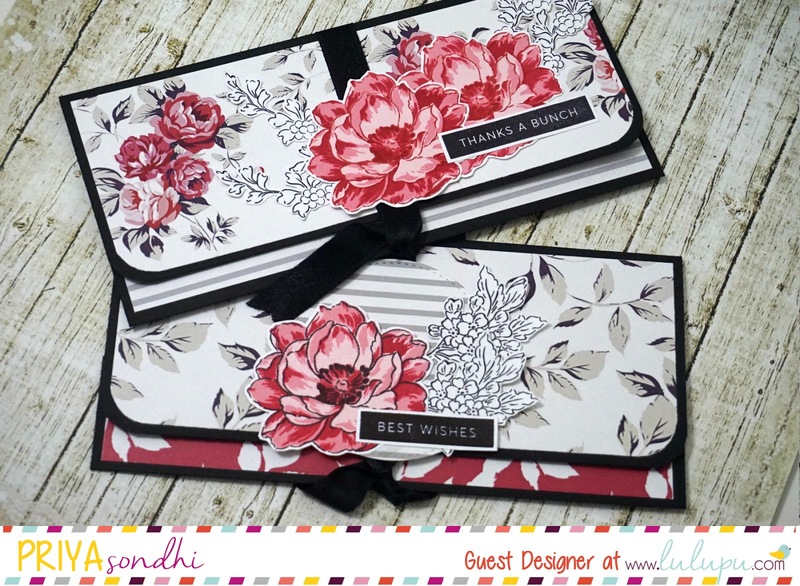 She is well known for her colour coordination skills, making beautiful backgrounds with distress inks and using patterned papers beautifully! I'm sure you are all going to love what she created for us. She is none other than Priya Sondhi. - Hi all! 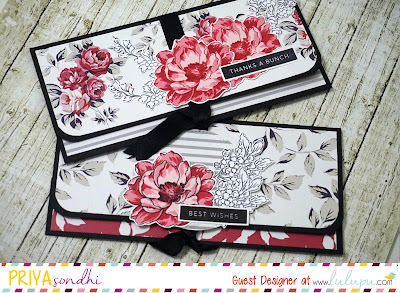 I am super duper excited to be invited at Lulupu store blog to be the Guest Designer today. I am a software engineer Team Lead by profession but at heart I am a full time paper crafter. I am from India but currently living in US for past 4 years because of my job. - From the childhood I was into crafts. I used to craft with my super talented sister. But during collage, I lost my touch and fell totally into academics. Roughly 6 years back when I was sitting idle in office, I stumbled across Martha Stewarts crafts. That's how I was introduced to paper crafts. I found it very interesting. Slowing I discovered craft blogs of many talented crafters from India like Tejal, Kavitha, Bhavana and also Karuna (Owner of Lulupu craft store). I was totally inspired by them and followed their blog and started crafting myself. One fine day I started to blog to share my crafty process. - My go-to supplies are my Tim Holtz Tonic craft scissors which I use alot for fussy cutting. Next one is my Fiskars Surecut paper trimmer; It's the best to cut paper with absolute precision. And last one is Martha Stewart Scorepal for basic scoring. - My all time favorite craft technique is creating backgrounds using heat embossing and distressing with distress inks. Now a days I am hooked to watercoloring with my Zig clean clear real brush markers. - I am an ever evolving crafter. Once I get a hang of a technique or style, I want to learn new techniques I have not tired or anything latest that comes in the craft world. I would describe my technique as clean and simple with minimum embellishments. I don't like my creations over loaded with different elements and embellishments. Majorly, I am into card making, but I love making bookmarks, envelopes, boxes, gift card holder, etc. - I have been crafting for around 6 years and blogging for about 5 years. - My style is clean and simple with one focus image/sentiment. - There are many people who has inspired me. 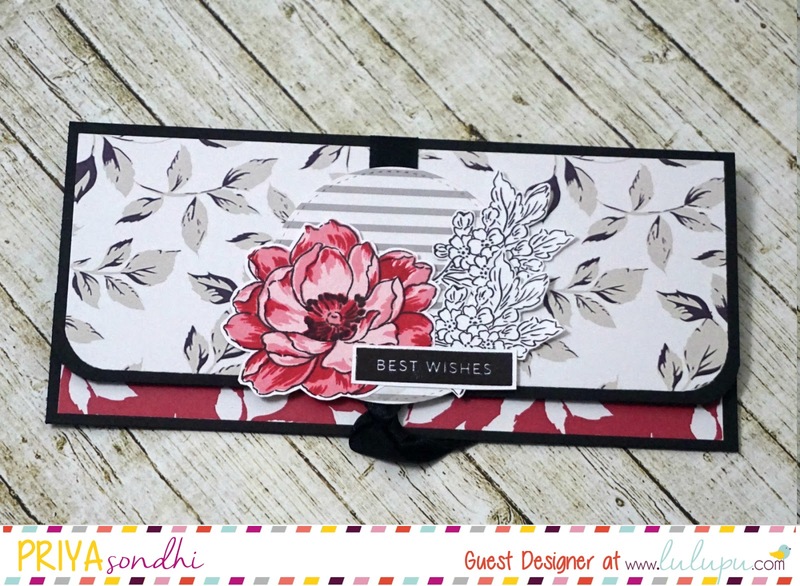 Crafters like Hussena, Tejal, Kavitha, Ujjwal inspired me to start crafting and blogging. Now a days, I goto Youtube and Pinterest when I need some inspiration. Also, ever ending support from my parents also inspires me to craft. My family feels proud of me that I spend my time in such a creative way. - Crafting is my only hobby. When I don't craft or not at my job, I try new dishes and reading about different cuisines. I love cooking and trying out different restaurants. Apart from Indian, I like Italian, Thai, Mediterranean and Ethiopian food. - Currently I am working on a craft order for notecards and bookmarks. Now I would like to share some creations I made using products available at Lulupu store. I have 3 bookmarks, 2 money envelopes and 1 card to share. 1. To start with, I took a black piece of cardstock measuring 8 x 7.5 inches and scored at 1.5 and 5 inches. 2. 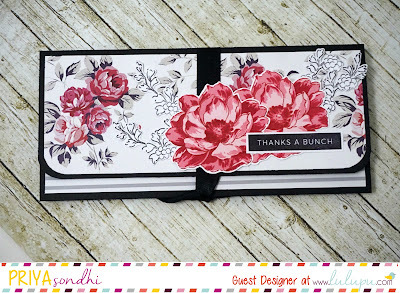 Then I layers it with pattern papers using Grey Bloom Paper Pack from Papericious. For the bookmarks, I used the same supplies above and some twine. The size of the bookmark is 5.5 x 1.5 inches. These are super easy to make and help you in reducing your stash of scraps you have been hoarding for a long time. 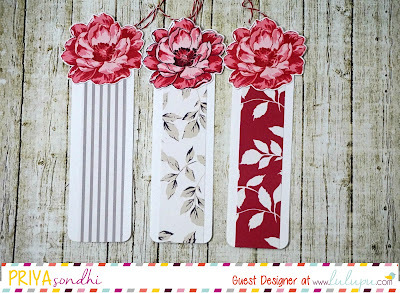 Bookmarks make a great gift too! 1. For the card, I used distress ink cardstock. 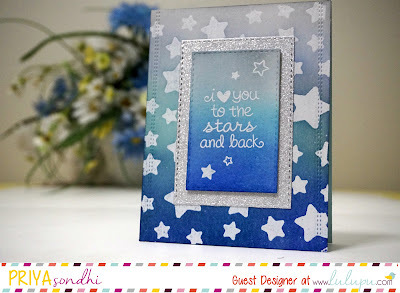 I used stargaze Mixable stencils from MFT and did some heat embossing using Versafine clear embossing ink and Tim Holtz Super fine white embossing powder. 2. After that I distressed the cardstock with Mermain Lagoon, BLueprint sketch and hickory smoke distress inks. 3. For the sentiment I heat embossed the sentiment from Lawn Fawn Lucky Star stamp set to match up with the background. I also used same set of distress inks to distress the sentiment cardstock piece. This is it from my side. Please leave some love if you liked what I shared. Thank you for having me here Lulupu! I don't know about you but my jaw hit the floor several times while going through her projects! Thanks so much for accepting our invitation, Priya! We thoroughly enjoyed looking at your projects. That's all from our side for this month. Catch you all soon with a brand new challenge on the 1st of September. Awesome Priya. Love your color combos. They are simply stunning. Thanks Lulupu. 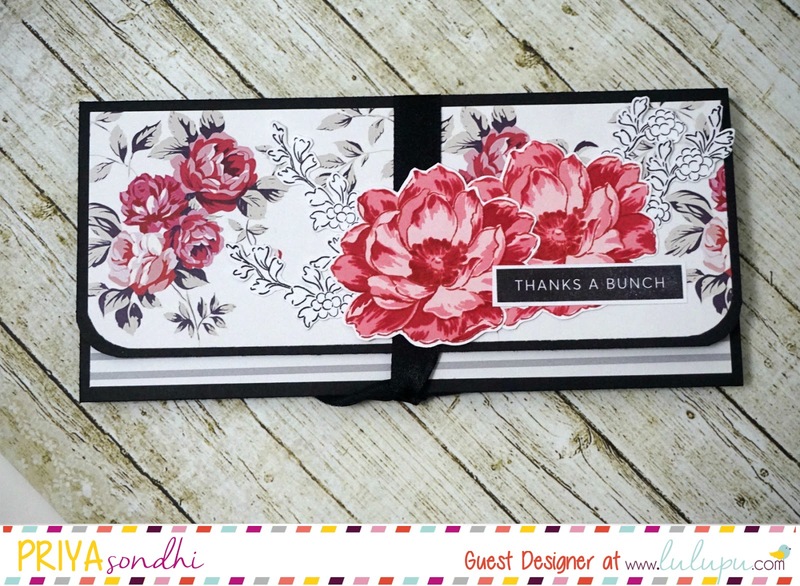 and the florals in the first card. Wow..As always Priya's creations are just amazing ! beautiful work Priya ,great to know you some more !! 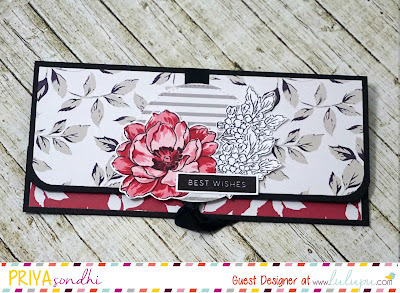 Gorgeous Projects as always...You play with papers, stamps so amazingly, Priya!! Love it a lot!! Awesome creations Priya!! Love the colors.